Carry Your Baby in a Carrababy! ...when you could take her with you? The Secret of Cycling Success! Don't you want your child to be a Champion Cyclist? Of course you do! Just because you never made it to the Olympics or the Tour de France, doesn't mean that you can't bask in the reflected glory of your child's achievements! If you want her to be a serious competitor, you've got to start while she's young! Many parents wait too long to expose their youngsters to the joys of competitive cycling. Influenced by overcautious pediatricians, they often wait until their offspring are old enough to sit up wearing a helmet, in an old-fashioned baby seat or trailer...but doesn't YOUR child deserve a head start? The sooner you get them on the road, the sooner they'll get used to the sights, sounds, aches and pains of cycling, and the sooner they'll learn to persevere in their training regimen regardless of how tired or sick they may feel, or how nasty the weather may be. If you let your baby's most formative months go by being a "crib potato" she may never develop the fierce competitive drive that will be needed to become a champion cyclist in the twenty-first century. She'll be racing against children of other parents who CARE about the sporting development of their little ones, and if she's going to be competitive, the time to start is NOW! That's where the new ShelBroCo Carrababy ® comes in! She may be crying now, but she'll thank you when she's on the podium! The Carrababy Baby Carrier is manufactured for ShelBroCo under exclusive contract by Carradice of England , using real ducks and other dead animals. The Carrababy Baby Carrier is reinforced with genuine TerrorLeather*. The Carrababy Baby Carrier is rated for babies weighing up to a maximum of 120 pounds. The Carrababy Baby Carrier is equipped with special drain holes, so you don't need to carry spare diapers on your training rides. The Carrababy is open to the elements. Although your body will shield your child from the full expeience of rainy day riding, the spray kicked up by the rear tire will help provide her with the authentic "rain-in-the-face" sensation, and help her become acclimated to cold and discomfort. 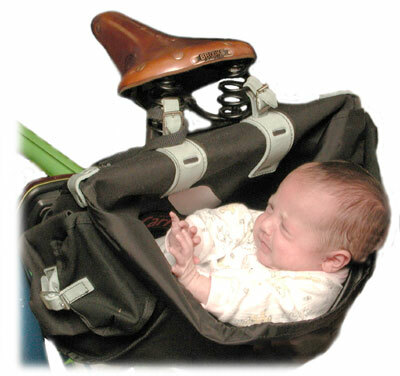 The Carrababy Baby Carrier should not be used when you are doing "wheelies" because the child may fall out. This would mean you'd have to turn around and pick her up, and you'd lose a lot of time that way. This product is so new that we have not yet determined the actual retail price. Whatever it turns out to be, you'll certainly want at least one. Send us your actual credit card (not just the number!) along with a sample signature, and when the price has been finalized, we'll charge your card accordingly. *Guaranteed for the life of the baby, or two weeks, whichever comes first. This guarantee does not apply to any Carrababy product that has been subject to abuse or neglect, off-road cycling, on-road cycling, or attachment to any saddle other than a Real-MAN saddle . Void where prohibited, prohibited where void, keep away from children and animals, use only with adequate ventilation. Note: Misuse of this product may lead to death or even serious injury! Ordinary leather is made from animals that have been painlessly slaughtered in modern, high-tech abattoirs, where everything is clean and neat and restful new-age music calms the animals before they're humanely, painlessly dispatched. This is all very well for the animal's peace of mind, but research has shown that it dosn't produce the toughest leather! TerrorLeather ® is a superior, tougher product. The patented TerrorLeather ® process begins when the cattle are fed fodder laced with FormaldeHide ® a very, very unique proprietary pre-tanning chemical concoction. While on the FormaldeHide ® diet, the cattle spend several weeks in a refrigerated enclosure with simulated hailstorms occurring every four hours. For the day of the actual slaughter, recordings of cattle in their death throes are played all day at high volume on a special state-of-the-art sound system, to get the subjects into the ideal state of mind. A special "eau d'abattoir" fragrance is also misted over the whole enclosure, just in case some of the subjects don't figure it out before hand. This pre-treatment has been scientifically determined to produce leather that is, on average, nearly 3% stronger than conventionl "humane" leather. Nothing is too good for our customers! Note! This page is a joke! Note the date above! ShelBroCo does not actually recommend carrying children weighing less than 80 pounds in an underseat bag! The baby illustrated above is a trained professional working under controlled circumstances...don't try this at home!